A prepaid card is a type of debit card which cannot go into credit (negative, or borrowed money). The clue is in the title - you “prepay” your card, i.e. load it with money, and then the card can be used for spending like a regular debit card. The key difference is that a prepaid card can typically never be overdrawn, or used for obtaining credit. A prepaid card will always have a positive balance. Where can prepaid cards be used? A great benefit of prepaid cards is that they can generally be used anywhere a regular debit or credit card can be used. MasterCard and Visa are two of the biggest providers of prepaid card technologies, so it makes sense that anywhere you see the their logos, payment via prepaid card should be fine. One area where prepaid cards might be commonly rejected, is in certain retail sectors where pre-authorisation occurs, such as "pay at pump" petrol stations. Similarly, most cards have a daily withdrawal limit which is typically smaller than a debit/credit card limit. Prepaid cards can be purchased from a wide range of retailers, both offline and online. Some of the large high street banks even also offer a prepaid card - like Virgin Money, and there are several store/gifts cards which work using prepaid technology. Then there are a whole host of specialist prepaid card providers which you might not be so familiar with - such as Pockit, Monese, Monzo - which only sell prepaid cards. How do I top-up a prepaid card? Most cards offer several ways of topping up or loading money onto the card, though some cards will charge for some of these methods, so read the terms and conditions of each card. PayPoint stations, of which there are more than 28,000 locations across the UK, including UK Post Offices. Some of the prepaid cards on the market make money by charging you every time you top-up. Typically, adding money to a prepaid card via bank transfer is the most common way of topping up without incurring a charge. Will a prepaid card affect my credit score? Generally, no. As most prepaid cards do not require a prior credit check - as no borrowing is being offered - there is no mark left on a credit file. This makes prepaid cards useful for those with poor credit scores who might struggle to get a bank account. There are a couple of prepaid cards which will allow credit - these cards circumvent the traditional lack of credit by essentially placing a loaned amount onto the card which is then paid back in small installments, “paying off” the card. Cashplus, and iCount are among the cards offering this feature. What can I use prepaid cards for? One of the key selling point of prepaid cards is that they have specific use cases which makes them attractive for certain scenarios. Holiday travel - many prepaid cards on the market offer favourable currency exchange rates, such as the easyJet card. By getting closer to the “real” exchange rate, users of prepaid cards can save money when abroad. WeSwap is another popular name in this category. 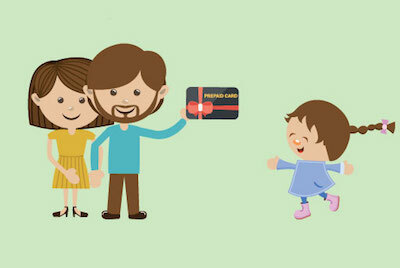 Controlling children’s spending - many prepaid cards, like the one from Osper are available that are aimed at parents wanting to monitor their children’s spending. Prepaid cards such as GoHenry, even offer two cards, one for the parent to top-up and see where money is being spent, and one for the child to use as a payment method. Pocket money for the 21st century. Current accounts for immigrants - cards such as Monese bill themselves as “the banking app for immigrants and expats”, i.e. those that might otherwise find it difficult to open a UK current account. By using a prepaid card like one of those from Lebara Money, customers can avoid having to open a full current account, but still spend as if they were using a debit card. Removing the possibility of getting into debt - as most prepaid cards don’t allow credit, they can be useful for students or those who might otherwise be reckless spenders! By only being able to spend what you add to the card, they can become a useful budgeting tool, for non-essential purcharses, perhaps. The Post Office call their card the "Budget Card" to help you "put aside some money for the bills". Relative safety vs. cash - most prepaid card providers have a limit of £50 liability limits if the card is lost or stolen. Many of the cards offer an easy way to freeze or block the card if it is misplaced. In this instance, cards like the ICE Travellers card might be useful. 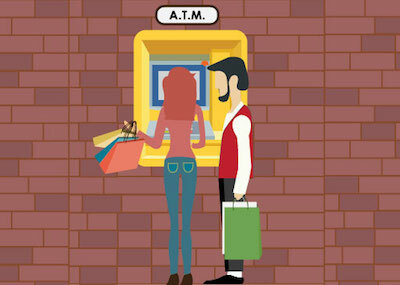 Withdrawing cash - while most prepaid cards will allow withdrawal of cash from a regular ATM, this can be an expensive way to access your money, as most will levy a charge on the withdrawal. Pockit, for example, charge 99p for each ATM withdrawal. Managing your finances - many prepaid cards have cutting-edge apps, in some cases, better than those which the major UK banks offer. These allow a granular view of where money is being spent, and offer some very modern budgeting tools. No impact on credit score - while prepaid cards don’t require a credit check, the lack of credit means that using your card won’t “build” your credit score like a regular credit card would. No Consumer Credit Act protection - payments made through prepaid card a not covered by the Consumer Credit Act which covers transactions of more than £100 on a credit card. No interest accrued on a balance - having money in even a current account like the Santander 123 current account can earn up to 3% interest. Carrying a balance on a prepaid card will usually earn zero interest, or in many cases, cost money - for example, Monese’s £4.95pcm charge for the card. Not accepted everywhere - certain retailers, such as on airlines, or trains, and online gambling sites might not accept prepaid cards. Which is the best prepaid card? There are now dozens of prepaid cards on the market. Many of these are underpinned by the same technologies, but their different positioning means that they can be used by a wide range of customers, with specific requirements. At Smart Money People, we collect reviews of prepaid cards from users like you, to help our community find the best products on the market. To find the best prepaid card for you, read our prepaid card reviews, or write a review of your own to help others.